For the first time, the IT Summit had to close registrations because the Student Union Grand Ballroom was at capacity. 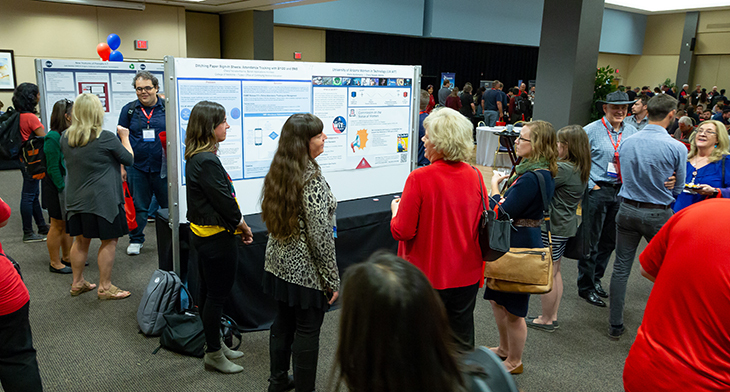 Over 600 people attended the sixth annual summit, where IT and related professionals from across campus learned from each other and from industry specialists about campus projects, services, processes, and tools. The IT Summit program on November 6 began with welcome remarks from CIO Barry Brummund and President Robert Robbins on the future of the UA and the Strategic Plan. Barry gave more extensive remarks after lunch on current directions in IT. Attendees chose from 47 sessions across eight topic tracks—the most extensive program yet. Twelve additional UA projects and programs were described in the poster session. Attendees also learned from the 15 sponsors who generously make the event possible. On Wednesday, November 7, the second IT Summit Workshop Day featured 14 workshops where participants were able to do a deep dive and get more hands-on with topics. New this year, Wednesday’s program also featured a HackFest, tackling issues benefiting from concentrated attention, and the University Libraries’ VR/AR Showcase, where visitors learned more about the wide variety of virtual reality and augmented reality use cases at UA. All the Tuesday IT Summit sessions were recorded this year, and will be linked from each session’s description in the program. Check back in early 2019 at itsummit.arizona.edu for next year’s date!